You may have not heard of Hocking Hills Ohio, and neither had I before a few months ago, but after visiting and seeing the breathtaking scenery, experiencing the warm hospitality, tasting the food, and having fun at the abundance of activities, I have concluded it is a hidden gem. Millions of trees with cabins nestled in the forest, and the scenic winding roads make Hocking Hills a romantic anniversary spot. You can have a fun family adventure zip-lining, canoeing, ATVing, horseback riding, and hiking. The food, wine, and candle making classes are ideal for a girlfriend’s getaway. Only two short 50 minute plane rides from Des Moines, the trip to Hocking Hills is short enough for easy traveling with kids, but far enough away from the rush of everyday life. Peak season is in the fall when the tall trees are changing colors and the air is cool enough for a comfortable hike through the caves. The winding roads up and down the hills are a beautiful sight, but be sure to bring your GPS or detailed maps of your destination. Most lodging and activities are nestled in the quiet forest of Hocking Hills, taking you far away from the city rush, but you can also easily get lost. With a wide variety of lodging possibilities in all price points, you could stay in a motel, or in a cozy room at a bed and breakfast, or even a mansion-like house with all of the amenities. Free activities are important for those traveling on a budget (who isn’t traveling on a budget these days?) Hocking Hills has many free activities for your enjoyment including hikes to Old Man’s Cave, Ash Cave Gorge, tours of the last remaining washboard factory in the US, attend the Washboard Music Festival or Lilyfest. View a complete list of free things to do at 1800Hocking. 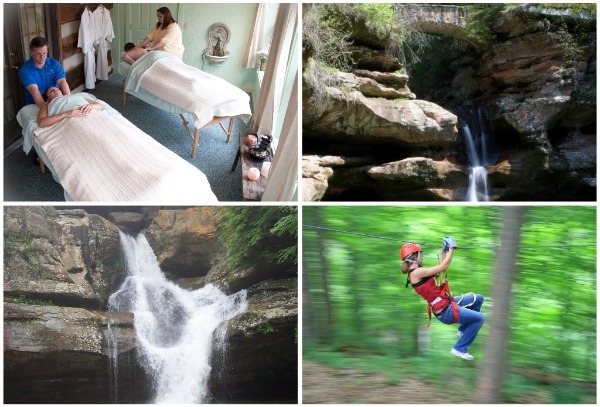 Hocking Hills, Ohio is your destination for…. Oh my goodness this looks like a nice, relaxing place to visit!! You know, I’ve been to Ohio and I never thought it was that beautiful. WOW, I’m shocked! I’ll have to go back! This is wonderful to hear about. My brother and sister in law live in Ohio so this is a nice getaway to share with them. This place looks so relaxing. I would LOVE to go somewhere like this as I could really use a vacation away from California! That looks beautiful. I would love to visit there sometime. Thanks for the recommendation! We also visited the Inn at Cedar Falls and had a fabulous time. This is really a place to retreat and reconnect with your spouse. The food is extraordinary as well! Wow, it looks so beautiful! I wish I could visit there one day. Maybe I will! I live 50minutes away from HockingHill, OH and its a shame that I am yet to explore it. But then again, we just moved here. Had so much fun with you!! Hope to see you soon. How did you like everything? Looks like we did a lot of the same things. Zip lining and dinner at the Inn at Cedar Falls were some of my faves. My husband and I just went to Hocking Hills last weekend! How funny that you just wrote about it as well. It’s a pretty wonderful place to get a way from it all. We definitely agree that paper maps are a necessity!